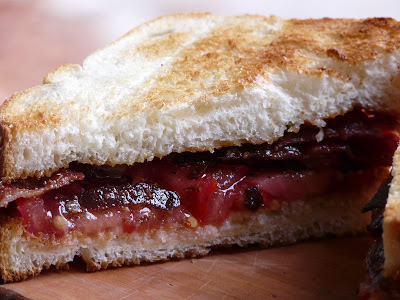 I made Moe a Toasted Bacon and Tomato Sandwich for breakfast. What better way to use the first tomato from our garden. Your tomato is a red, red jewel! Well, Ann ~ here I am at 7:30 am longing for a sandwich just like that right now. Your photos always do that to me! 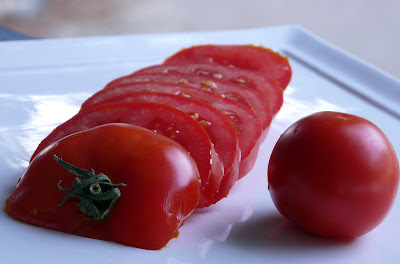 It looks delicious; I've never enjoyed a tomato more than one plucked, ripe and juicy, from the garden. We're very fond of Early Girls, too ~ I love the size and the flavor. 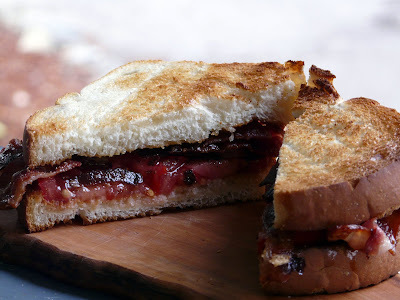 A great way to start the day, bacon and fresh tomatoes. This would be perfect any time of day. Looks great. My must have with the first tomatoes is a cheese and tomato sandwich on white with mayo and salt. Takes me wayyyy back. Have you ever grown 4th of July? I have some this year and they were ahead of Early Girl and have a good flavor..not as large, but still fun to pull them early. That is one perfect tomato. The color is gorgeous. I'm glad you used it for your sandwich, which is just about my favorite sandwich. 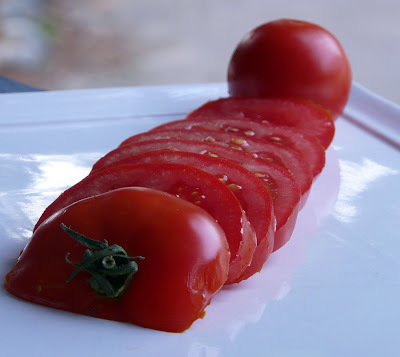 It really lets the flavor of the tomato shine through. You've certainly got a green thumb! I could easily go for that BLT without the L.
Last night's dinner was a huge plate of steamed corn on the cob. And fresh berries for dessert. Today, I'm craving your tomato sandwich. These are the only reasons I love summer.